Inspired by the classic elegance of antique European whole-cloth quilts, Adelia White Collection features meticulously hand-stitched diamond quilting covering the front and back. The hand-pleated border on all sides is finished with an additional vintage-style flat flange. 100% cotton. By VHC Brands (formerly Victorian Heart). Adelia White King Bed Skirt, by VHC Brands. Dress up your bed with our elegantly hand-pleated Adelia Skirt. Adelia White King Quilt, by VHC Brands. Inspired by the classic elegance of antique European whole-cloth quilts, Adelia White King Quilt feature meticulously hand-stitched diamond quilting covering the front and back. 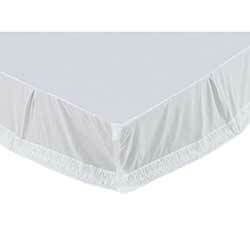 Adelia White Queen Bed Skirt, by VHC Brands. Dress up your bed with our elegantly hand-pleated Adelia Skirt. Adelia White Queen Quilt, by VHC Brands. Inspired by the classic elegance of antique European whole-cloth quilts, Adelia White Queen Quilt feature meticulously hand-stitched diamond quilting covering the front and back. Adelia White Twin Bed Skirt, by VHC Brands. Dress up your bed with our elegantly hand-pleated Adelia Skirt.